Post Brexit Citizenship Status: Divided by the Rules? The existing paradigm of two main citizenship categories (EU and non-EU) will be expanded to include many more sub-divisions should the current Brexit proposals proceed (as is shown in the table below). Topics explored at the conference will include: entitlements differentials, citizenship status and rights, racial profiling, compliance with the Belfast/Good Friday Agreement, ‘hostile environment’ measures, the scope of the ‘Common Travel Area’, and the retained EU citizens’ rights provisions under the EU Settlement Scheme. To book a place at the conference, email events@caj.org.uk. Please state any access or dietary requirements. Chair: Dr Anna Bryson (Senior Lecturer, QUB), with members of the BrexitLawNI and Equality Coalition teams. The Equality Coalition is Co-Convened by CAJ and UNISON. 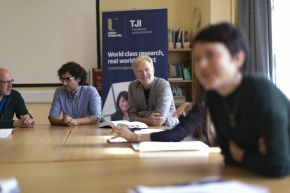 BrexitLawNI is a collaborative ESRC-funded research project between CAJ and the Law Schools of Queen’s University Belfast and Ulster University. This event is supported by the UNISON Campaign Fund and Queen’s University Belfast.